Seventh Street Books, 9781616148812, 352pp. Former topnotch attorney Parker Stern, still crippled by courtroom stage fright, takes on a dicey case for an elusive video game designer known to the world only by the name of "Poniard." In Poniard's blockbuster online video game, Abduction!, a real-life movie mogul is charged with kidnapping and murdering a beautiful actress who disappeared in the 1980s. Predictably, the mogul--William "the Conqueror" Bishop--has responded with a libel lawsuit. Now it's up to Parker to defend the game designer in the suit. In defending Poniard, Parker discovers that people aren't who they claim to be and that nothing is as it seems. At one point, his client resorts to blackmail, threatening to expose a dark secret about Parker. Then, many of the potential witnesses who could have helped the case die prematurely, and the survivors are too frightened to talk. Parker begins to feel as if he's merely a character in a video game, fighting malevolent Level Bosses who appear out of nowhere and threaten to destroy him. 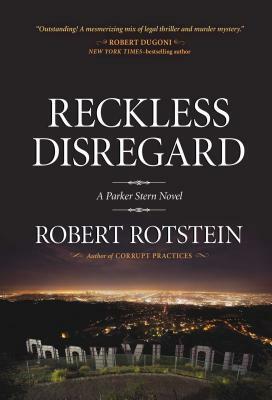 ROBERT ROTSTEIN, an entertainment attorney with over thirty years' experience in the industry, is the author of Corrupt Practices, the first Parker Stern novel. He's represented all of the major motion picture studios and many well-known writers, producers, directors, and musicians. He lives with his family in Los Angeles, California. "Endless novelties, endless twists, endless complications, endless surprises in and out of the courtroom. Whatever you read legal drama for, it’s here, along with a whole lot of other stuff you never thought to ask for." "Rotstein gives his hero, L.A. courtroom attorney Parker Stern, a refreshingly new and entirely credible hero’s impediment—stage fright. . . . An intriguing aspect of this legal thriller is the way that the action tends to mimic a video game, with Stern getting more and more enmeshed with false leads and bad guys. . . . Stern is a wonderfully complex hero in an occupation that forces him to combat his limitations. And this novel’s action really puts the 'thriller' in legal thriller."